Stockman Group has a commercial portfolio of 25 plus buildings in Christchurch and Timaru with a mix of industrial, retail, hospitality and office (and a niche in small office space through Above Your Space). 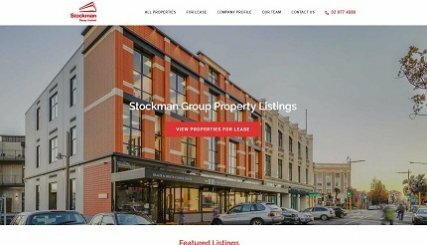 Their new website, powered by WordPress CMS, showcases all of their properties with a highlight on the ones that are available for lease. It includes a property map for users to easily view the various properties throughout Christchurch and Timaru. Each property is showcased with a full image gallery and a comprehensive property description, making it easy for users to enquire about a property. Our group of companies have engaged the services of Limelight Online for the last 10 years to build, host, design and maintain all of our web sites (including www.aboveyourspace.co.nz and www.kpirothschild.co.nz). We have been more than happy with the service and expertise offered from the staff at Limelight and on all levels we find them relaxed but professional. They always understand both our needs and the job at hand. The investment in these sites has more than paid off with the enquiries and business that comes off them with the benefit of the ongoing awareness of the business and what we are and what we do.